Arezzo silveware has a gorgeous modern style with a minimalistic look. The mirror finish adds a touch of class to your dining experience. In addition, this set matches all of our china patterns, and especially Lilly Coupe; Dinner Plates, Luncheon Plates, Salad/Dessert Plates, Saucer & Cups. 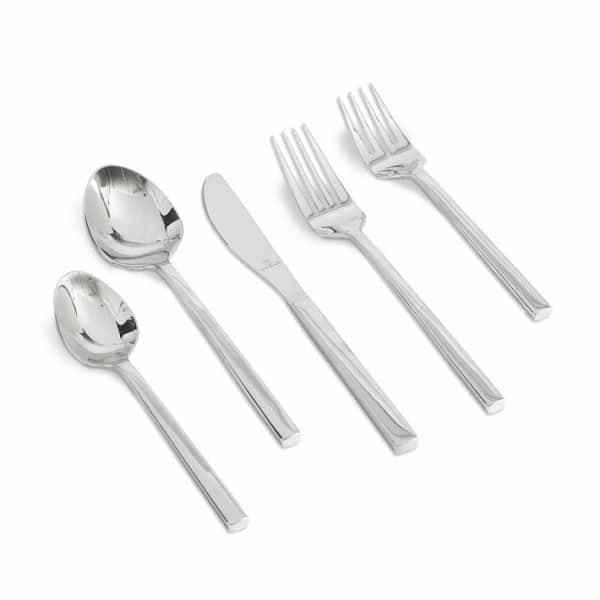 For a more ornate and/or formal set please check out our Baroque Silverware Set. However, if silver does not match your color scheme and you would like something warm and metallic try our Gold Elegance Silverware Set. Lastly, pair this set with dinner napkins and wine glasses for a final touch. **We ask that you return all China, Glassware, and Flatware free of food debris and liquid therefore rinsing and repacking it properly in the crates we provide (ready to be sterilized). A minimum $35 cleaning fee will be imposed if items are not returned rinsed. *$60 refundable deposit on all rental items (cleaning/replacement).